As everyone knows by now, singer Whitney Houston was found dead in a bathtub at a Beverly Hills hotel on Saturday, 11 February 2011. She was pronounced dead at 3:55 p.m. (6:55 p.m. ET) at the Beverly Hilton. As I write this, the autopsy has not been done and the official cause of death is unknown. If we look at her primary directions involving her 8th house at the time of her death, we find that the opposition of 8th house occupant Neptune came to natal Saturn on 29 Dec 2011 and was clearly in effect during this period (Regiomontanus primary, with latitude, Naibod rate). For a Hellenistic take on the astrology of the singer’s demise, I recommend the discussion at Seven Stars Astrology. Determination of the official cause of death may take weeks. This entry was posted in Astrology and tagged converse solar return, primary directions, singer whitney houston, solar return, Whitney Houston. Bookmark the permalink. Thought you might be interested if you haven’t noted it already that tropical SR for LA sec prg (MSQ Q2) to date/time of death reveals 29Aq13 Asc — exactly thereby conj/= 00/180 SR exact Mercury- Neptune opp, so Asc exact conj SR prg Mercury in 29+ Aq with Desc exact conj SR prg Neptune in 29Aq52, both Rx. In the Q1 MSQ (SR sec prg) Asc, the Asc is in 28Aq36, thereby still within 1dg of exact to Mer-Nep opp, both SR prg and SR, but with Sat in 13+ Libra making an exact sesquiquadrate to SR prg Asc in 28:36 (therefore = Asc-Desc exact), and with both prg SR Sat in 13+ Libra and prg nightime Pars Fortuna in SR sec prg VIII (with PF also within only 1dg of exact =/135 to Asc-Desc axis). As you mentioned, SR sec prg Saturn in Libra is exalted ruler SR sec prg VIII cusp PF in 12+ Libra exactly on cusp of SR sec prg VIII as well as ruler of SR prg XII. Interestingly, the MC of this (Q1) SR sec prg LA chart is in 11+ Sag, closely conj Sibley USA figure. Also noted that Asc of LA-relocated tropical SR was exactly superimpositionally conj natal Desc within 52min, signififying that, in addition to possible important new relationship in SR New Year (writing on Valentine’s Day), which I heard thru sources she had, as well her upcomingly scheduled return to public life (VII cusp), is also the point of “sunset” – which as you have pointed out in previous books of yours – is the place of the dead/”Other Side.” Further note that on both Q1 AND Q2 SR sec prgs for SR calculated for natal location (Newark) MC in 21+ Capricorn is less than 1dg separating from exact square to natal True Node (haven’t calculated for Mean Node – but certainly this is an opportunity to see what shakes therein between these two alternative Nodes). All for now. Haven’t looked yet at precession-corrected figures. PS: Also synched in to your October Steve Jobs blog and loved it, but haven’t tested with this methodology yet. Look forward to playing with converse solar returns as well as converse directions and progressions for all kinds of charts. Much thanks. Great comment. You really should present your ideas and methods in book form. You have a lot to say that other astrologers would enjoy learning about. I didn’t spend a lot of time with the Los Angeles Solar Return because I did not know where she spent her birthday. She may well have been with her family in New Jersey. I generally look at the converse return only after looking at the non-precessed and precessed solar returns. Sometimes it gives striking information, but time is limited and it’s hard to look at every variation of a return. On the other hand, I always look at converse progressions and directions. The image I have is of time spreading out from the birth moment like ripples of concentric circles in a pond. Primary directions are a wonderful “lost art,” although they are now gaining in popularity. There is an excellent free program called Morinus that calculates primaries: https://sites.google.com/site/pymorinus/Home . For some reason Solar Fire, which is the program I use most often, is fairly useless for working with primaries. I used to use the CCRS92 DOS program, but its routines are now available in Janus software, which has a nice interface. In the current economy, budget-conscious astrologers should check out the Morinus program. It just does calculations, no interpretations, but is highly sophisticated. The best book available on primaries is the one by Martin Gansten. Thanks, Tony. I look at the SR for place of birth (which I refer to as the “Mission Chart” in the book I’ve already written but am currerntly re-writing) in a case like this before anything else; always find something pretty dramatic going on. Figured that – even if she wasn’t in LA for birthday – it would show up presentationally in its capacity as a relocational SR. However, the MC of the Newark trop return (as am sure you’ve noticed) in 17dg Cancer exactly sq her natal Moon in 17 Aries is surely consistent with promise of a hard route to renewed public attention (among other things); also note Sag SR Moon in dg of Galactic Center), and when we SR sec progress this figure to event of death, an 8-dg Taurus Asc, less than 1dg (Q2) from SR Jupiter is revealed (<2dg Q1) is revealed, with 9-dg SR Jupiter emanating from Mission SR in Newark conj House VIII cusp (<3dg). 'Thought it amazing the progressed angular emphasis on Regulus in the Mercury opp Neptune context as per LA SR prg Asc to that point on her death. Surely, she was a truly ragic Queen – though I have to think, fortunately (with SR Newark sec prg Asc conj SR Jupiter and VIII-ruler Venus applying imminently to sextile with close Mission Asc-Saturn conjunction), that her death was painless, if not pleasant. With the prg SR Mercury-Neptune opp featured via prg SR Asc in LA and SR trop Moon on Galactic Center, I can't help thinking it a no-brainer – if/when looking for purpose herein – that this death is supposed to be instructive/perspective-enhancing to Whitney's fans of all ages (especially young adolescents = 29-dg Mercury in Leo opp Neptune) regarding the perils of intoxicants and that somehow there had to be serious intention from "Central Casting" and on the part of her invisible helpers/guides in influencing her life play toward that end (speculation, of course). Astrology continues to be awesome. 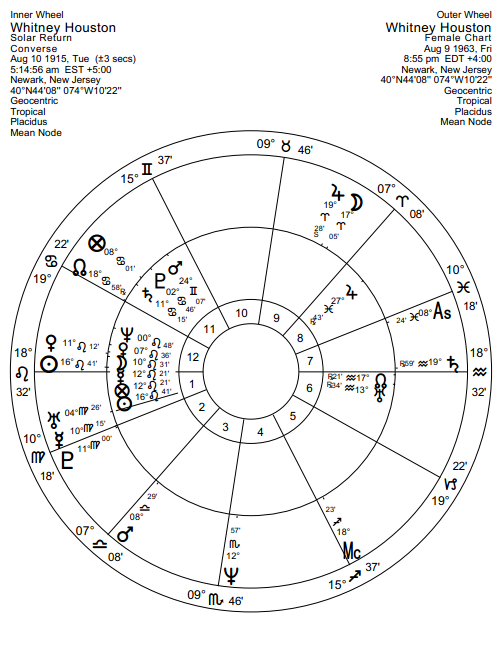 Without astrology, we already know that Whitney's life was pointedly NOT a waste. What astrology shows (to me at least) is that her death wasn't either, though I strongly suspect I "walk the line" in saying this. No need to apologize. Your comments are thoughtful and enlightening. 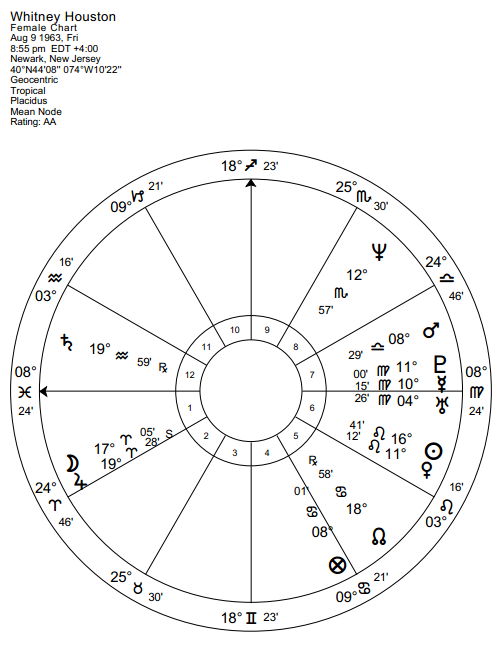 I always learn something new by seeing how other astrologers approach a chart. I’m sure readers of this post and your comments will feel the same.